In a final shot as defense minister, Avigdor Liberman on Friday lambasted his former colleagues in the security cabinet, saying they’d “effectively” given the leaders of the Hamas terror group “immunity” during this week’s intensive round of violence. “It simply makes no sense that after Hamas launches some 500 rockets at Israeli communities outside Gaza, at the south of the country, the heads of Hamas effectively get immunity from the Israeli security cabinet,” he said during a farewell visit to the south. Liberman, who tendered his resignation on Wednesday, also warned that Israel’s policies toward Gaza were threatening to allow the Hamas terror group — considered by the Israel Defense Forces to be a comparatively minor strategic threat in terms of raw military power — to become akin to Lebanon’s mighty Hezbollah terrorist army, which is seen as the Jewish state’s main rival in the region with an arsenal of over 100,000 mortar shells, rockets and missiles. 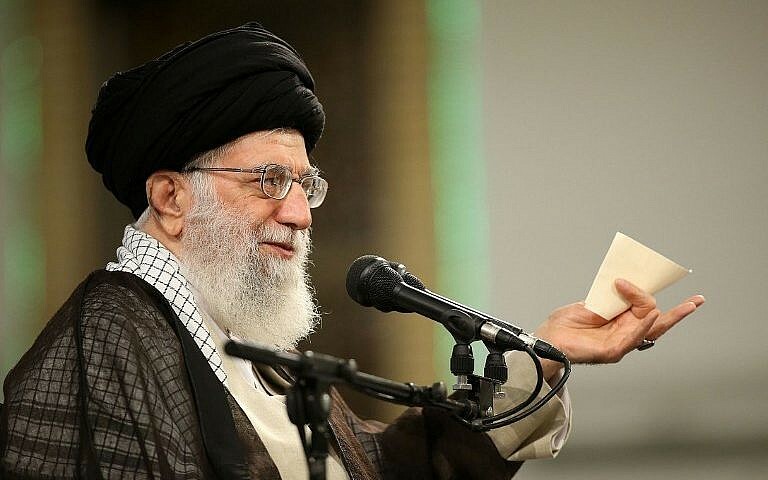 “We are currently feeding a monster, which if we don’t stop its rearmament and force-building — in a year we will get a twin to Hezbollah — with all that entails,” he said. 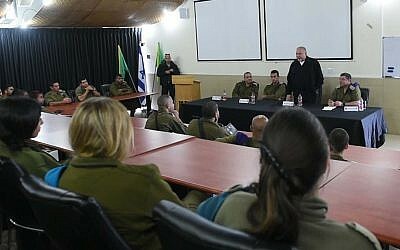 Liberman made his remarks on Friday afternoon, hours before his tenure as defense minister came to an end, following meetings with officers and soldiers from the IDF’s Gaza Division and with civilian security officials from the communities near the Gaza Strip. On Wednesday Liberman announced he was resigning as defense minister— a position he’s held since May 2016 — specifically citing the government’s policies toward Gaza and its rulers Hamas as the main reasons why. The defense minister’s resignation came a day after a de facto ceasefire went into effect, ending a 25-hour flare up that saw the largest-ever barrage of rockets and mortar shells fired at southern Israel, killing one and injuring scores more. “For the past two and a half years, I have bit my tongue. I tried to change things from within, but the last two decisions — on the transfer of $90 million to Hamas over the next six months and the decision on the ceasefire — these were two decisions that went too far,” he said. Liberman was referring to a decision to allow Qatar to send funds into Gaza, which was meant to pay salaries of Palestinian civil servants in the Strip — after the Palestinian Authority decided to withhold those funds in a bid to punish its rival Hamas. Earlier this month, the first batch of Qatari funds — $15 million — was brought into Gaza, which was seen as embarrassing for the Israeli government when pictures of the cash in suitcases were released to the media. The outgoing defense minister noted that the first people to receive payments from the Qatari funds were families of Palestinians killed during clashes with Israeli troops on the Gaza border, not civil servants. In the months prior to the flare up, Liberman had repeatedly and publicly called for a military operation against Hamas in the Gaza Strip, claiming it was the only way to return calm to the communities in southern Israel, which have periodically been pummeled by fusillade of rockets and mortar shells. The defense minister reiterated this position on Friday, saying Israel should have launched a military campaign against Hamas this summer, with the end of the school-year. “It’s not a secret, I thought that right after the tests, right after the school exams in July, we needed to deal a strong blow [to Hamas] — and we didn’t do that,” he said. In Friday’s press conference Liberman also responded to a question about a claim he made prior to becoming defense minister, that he would give Hamas leader Ismail Haniyeh 48 hours to return two Israeli civilians and the remains of two IDF soldiers currently in the terrorist group’s custody in Gaza and assassinate him if he didn’t. Without mentioning him by name, Liberman also appeared to attack one of his main political rivals, Education Minister Naftali Bennett, who is now vying to take over as defense minister. “The same people who would torpedo every decision [in the security cabinet], every tough choice in the cabinet’s discussions in the evening, would appear the next morning on talk shows and ask, ‘What about the 48 hours? What about Haniyeh?’” Liberman said. He brushed off the arguments made by some defense analysts that the government refrained from conducting a campaign against Hamas in Gaza because it preferred to focus the military’s intentions on threats in Iran, Syria and Lebanon. “It’s all excuses,” he said. The defense minister reiterated his position that his issue was with the cabinet’s decisions, not with the military’s actions or abilities. “The blame cannot be rolled onto the IDF. The responsibility is on the political leadership. The IDF is subordinate to the political leadership’s decisions,” he said. 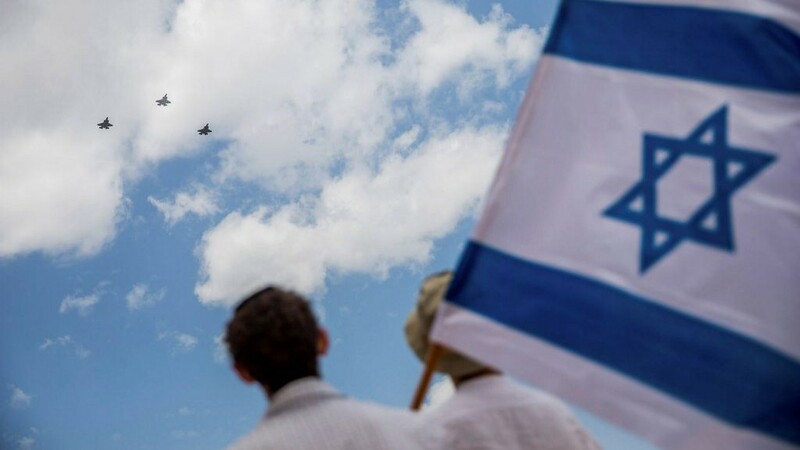 According to the military, over 460 rockets and mortar shells were fired at southern Israel over on Monday and Tuesday — more than twice the rate at which they were launched during the 2014 war. 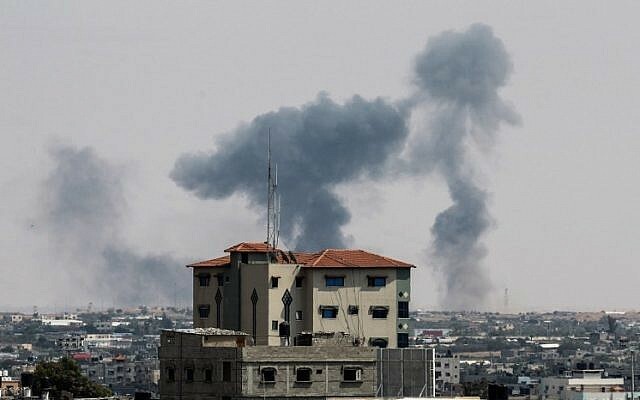 The Egyptian-brokered ceasefire, which was announced by Hamas on Tuesday evening but not officially confirmed by Israel, appeared to largely be holding as of Friday morning. 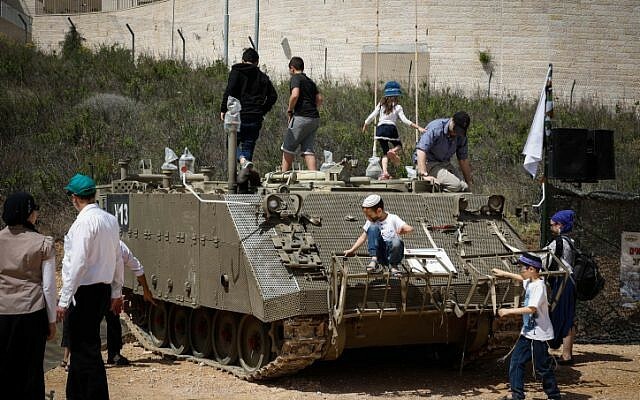 However, the Israeli military kept reinforcements in place and ordered troops to remain on high alert out of concerns that border violence may again break out. 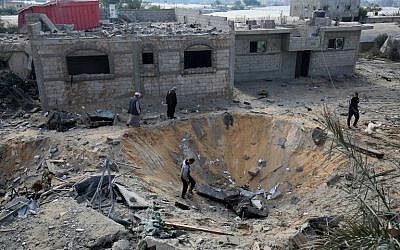 The destruction of the tunnels came as Israeli planes pounded Gaza in response to a morning barrage of mortar fire, including one shell that landed in a kindergarten playground shortly before children were due to arrive. 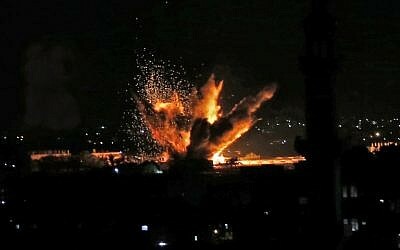 The IDF said it struck over 35 terror targets in Gaza throughout the day, belonging to Hamas and Islamic Jihad. These included weapons caches, naval targets and terror headquarters, the IDF said. 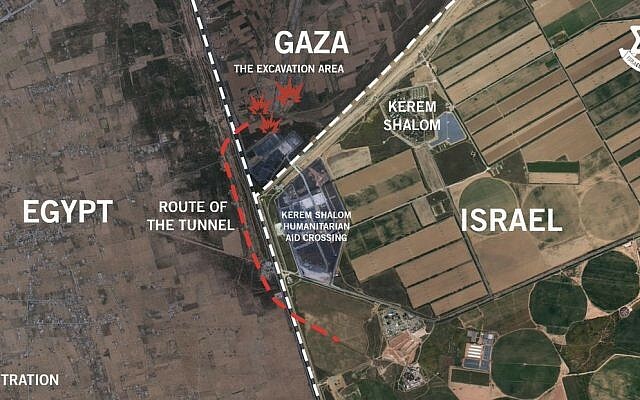 Hamas identified one of the targets as a training facility. 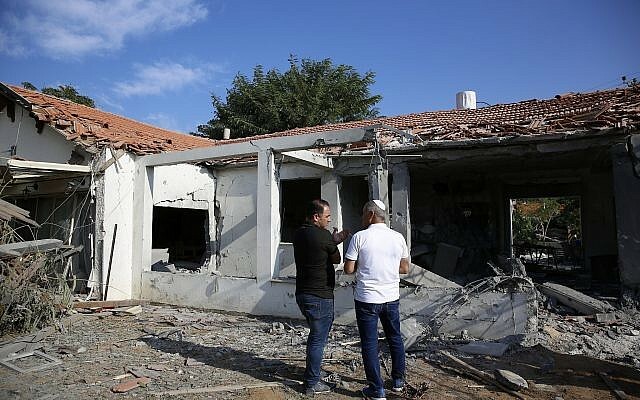 Some 28 mortar shells and rockets were fired into Israel by Palestinian terror groups Tuesday morning, and media reported dozens more in the afternoon following the strikes. 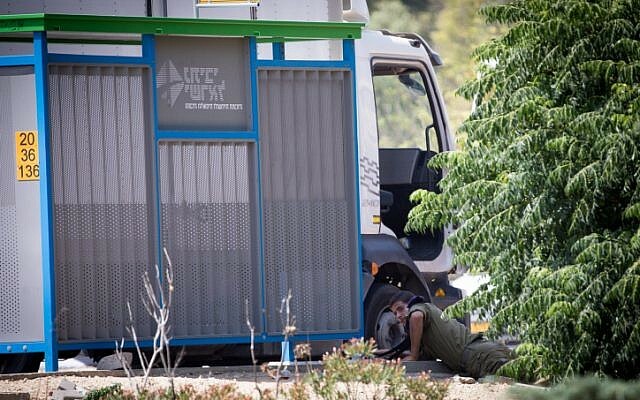 Three Israeli soldiers were lightly injured from shrapnel in the afternoon attacks. 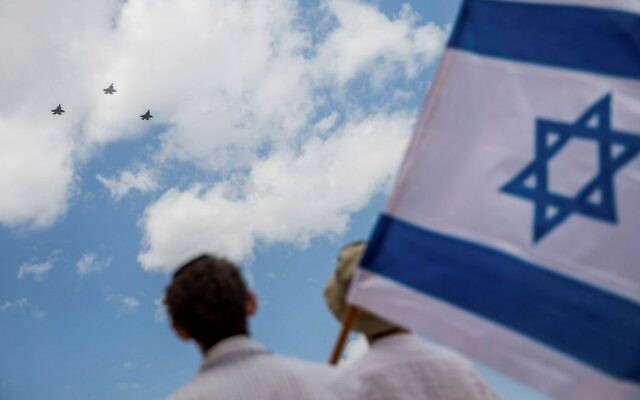 The military said a total of 25 projectiles had been knocked down by Iron Dome missile defense batteries as of 4 p.m., though the tally was not official. The morning attacks were mounted by the Iranian-backed Palestinian Islamic Jihad terror group, apparently in revenge for the IDF killing three of its members in a cross-border exchange earlier in the week. 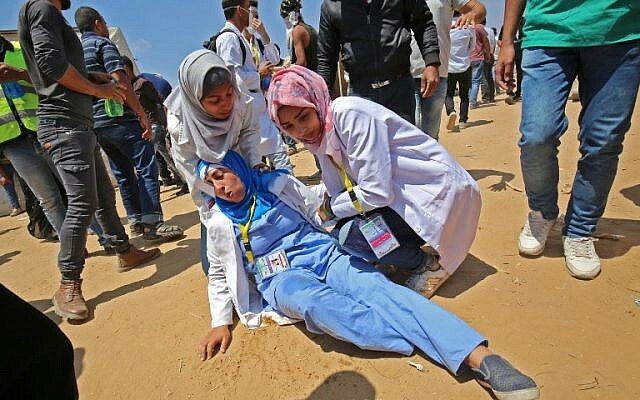 The Israeli military, however, ultimately blamed the barrages on the Hamas terror group, which rules Gaza, saying the barrages were the result of the organization’s “failures” to successfully attack Israel during the recent riots along the border. There was no claim of responsibility for the afternoon barrage. As a matter of policy, the Israeli army considers Hamas, which rules Gaza, to be responsible for any attack emanating from the beleaguered coastal enclave. Prime Minister Benjamin Netanyahu had vowed to respond “with great force” to the mortar shells, one of which landed just outside a kindergarten less than an hour before children were due to arrive. Defense Minister Avigdor Liberman said the military had launched a “massive and forceful” retaliatory attack. Defense officials reportedly said the next 24 hours would be “intense” amid the worst escalation on the Gaza border since the 2014 war, known in Israel as Operation Protective Edge. 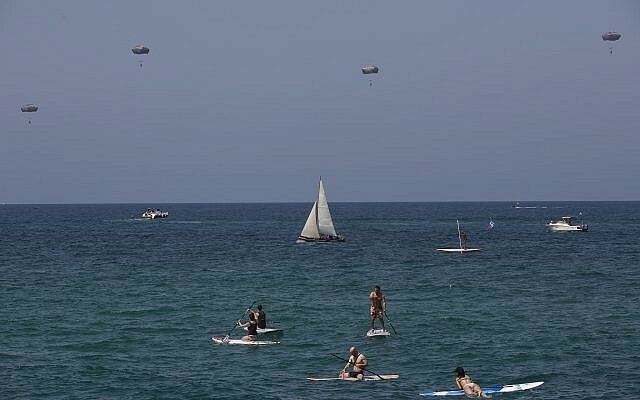 The army evacuated the Zikim beach near Gaza, while local authorities in the region told residents to stay near their bomb shelters in the coming hours. “Israel views the attacks on it and on its communities by Hamas and Islamic Jihad from the Gaza Strip with great severity,” Netanyahu said earlier, during a conference in the northern Galilee region, ahead of urgent security consultations set to take place later in the day. 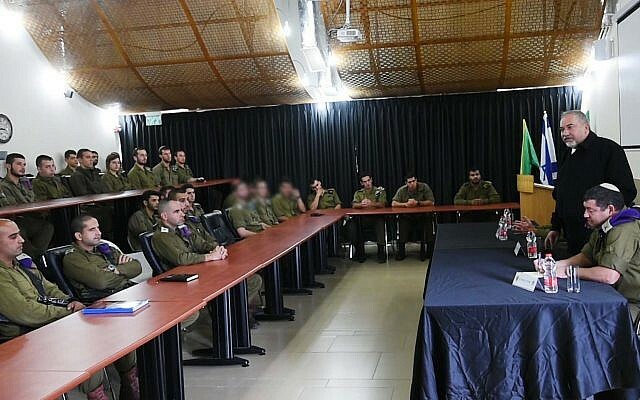 Defense Minister Avigdor Liberman earlier called a “special situational assessment” at army’s Tel Aviv headquarters with IDF Chief of Staff Gadi Eisenkot and other senior figures from Israel’s security services, his office said. Judah Ari Gross and Michael Bachner contributed to this report. 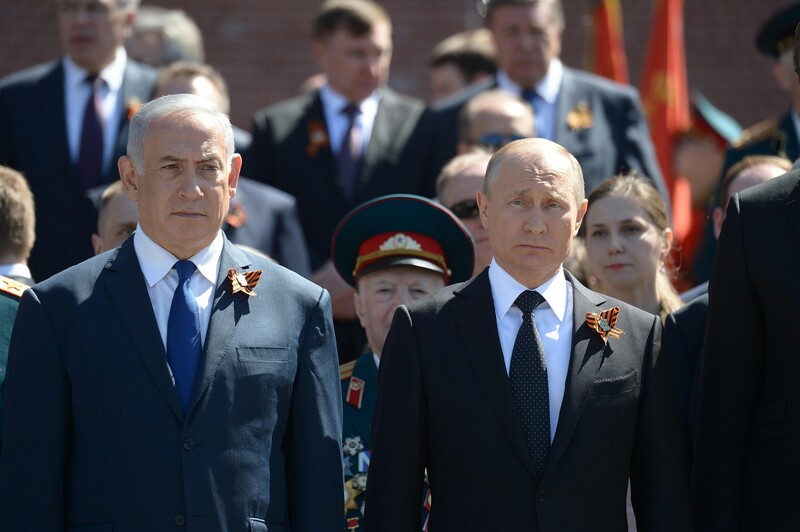 MOSCOW — Russian intelligence foiled a terror attack on this week’s massive Victory Day memorial march in Moscow, a top Russian diplomat said on Friday. The announcement came as Russia is gearing up to host the World Cup next month. Russia’s top intelligence agency last month reported the arrests of men suspected to have links to the Islamic State group in Siberia and the Moscow region. The FSB agency said four members of the suspected IS “sleeper cell” were detained in the Moscow region after they traveled from Novy Urengoi, an oil town in western Siberia. The FSB said they plotted attacks in Moscow and were receiving orders from IS members in Syria via a messaging app. Oil and gas-rich western Siberia has for decades attracted workers from all over Russia, including the predominantly Muslim North Caucasus. Russia has been providing air cover for Syrian President Bashar Assad since 2015, while thousands of its own citizens went off to Syria to join IS in fighting against Assad’s government. 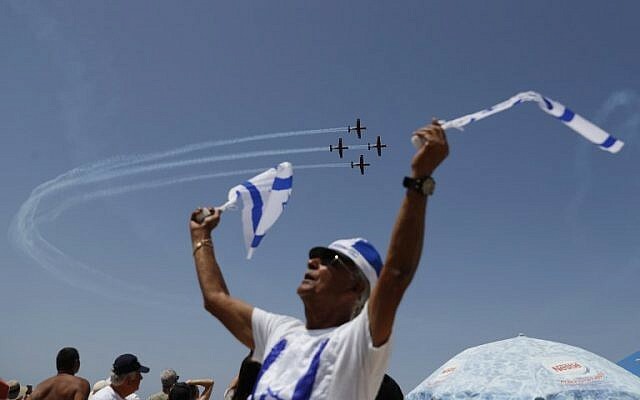 Hundreds of thousands of Israelis flocked to beaches and parks, lighting grills, waving flags and craning their necks for a glimpse of Israel’s fighter jets to mark the country’s 70th Independence Day on Thursday. 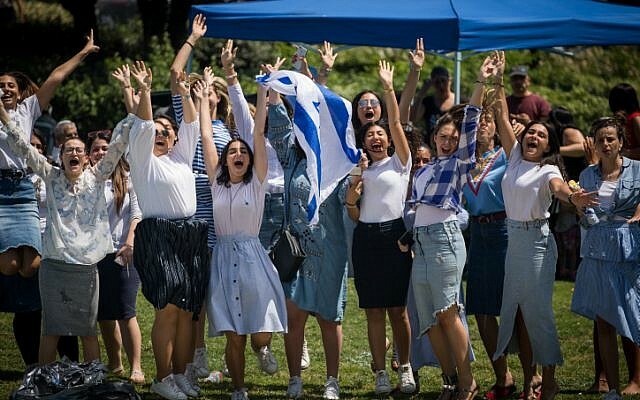 After a night of fireworks, concerts, parties and an emotional crossover from Memorial Day to Independence Day, most Israelis were spending the day, a national holiday, celebrating the country’s birthday. 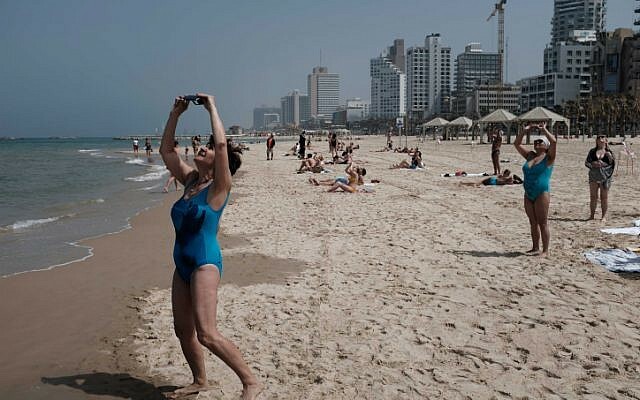 Some 200,000 Israelis were at the country’s national parks, with 48,000 visiting the Banias Nature Reserve in the Golan Heights and 18,000 camped around the Sea of the Galilee, according to the parks authority. 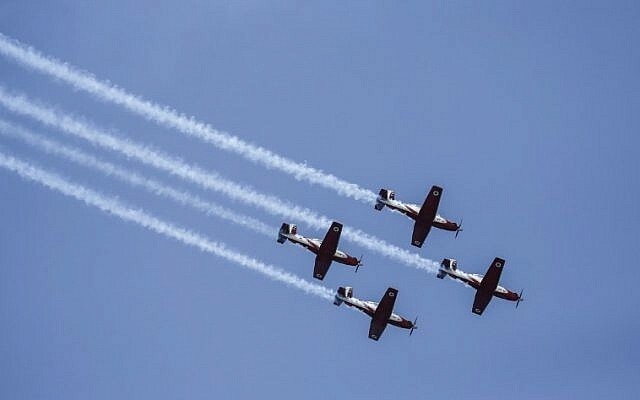 A highlight of the day was the cross-country flyover of military jets and helicopters, which for the second year included Israel’s fleet of F-35 jets, considered the most advanced plane in the world. 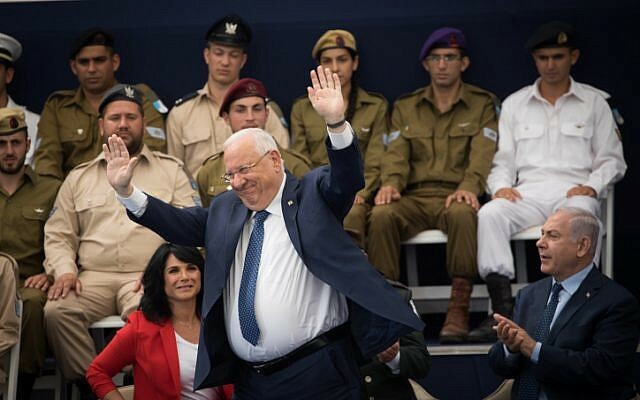 Celebrations in Jerusalem kicked off Thursday morning at the President’s Residence in Jerusalem, where President Reuven Rivlin was hosting Prime Minister Benjamin Netanyahu, Defense Minister Avigdor Liberman, IDF chief Gadi Eisenkot and others for a musical ceremony honoring over 100 soldiers receiving commendations for excellence. The annual international Bible Quiz competition finals took place after the ceremony. The winner of the contest was named as Azriel Shilat, from Hatzor Haglilit. The IDF also opened its bases to the public, displaying jeeps, tanks and other equipment throughout the country. 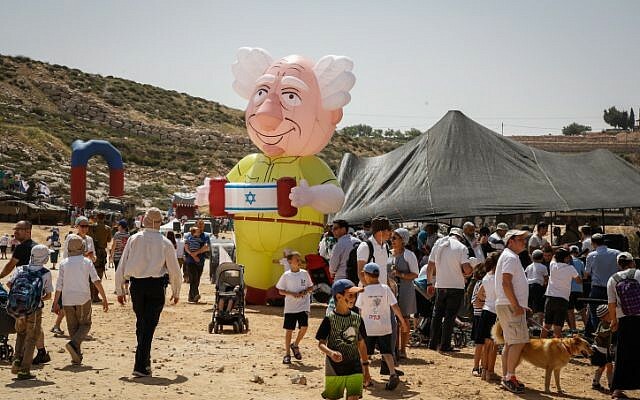 More than 20,000 Israelis attended an open house day at a national training facility for police officers, hosted by the Public Security Ministry. Police said around 3 p.m. that all parking spots allocated to visitors filled up and asked the public not to near the area. On Wednesday night, the mournful and somber speeches of Memorial Day gave way to joyful celebrations, with flags promptly raised back from half-staff. The juxtaposition of the two days is a key element of Israelis’ experience of national independence, ensuring that no commemoration completely excludes the achievement wrought by the sacrifice of the fallen and their families, and that the elation of independence is never far removed from an awareness of its cost. At the military cemetery on Mount Herzl in Jerusalem, the transition was marked with an extravagant state ceremony featuring the lighting of torches by 12 people who are seen to have made an outstanding contribution to society — as well as one by Prime Minister Benjamin Netanyahu, and another by Knesset speaker Yuli Edelstein — and much singing and dancing. 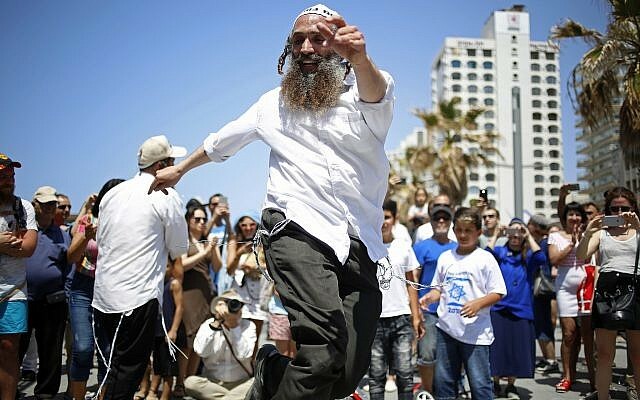 The ceremony featured an elaborate musical flashback of Jewish history, with actors singing and dancing through events dating back to the biblical era. On tolerance towards newcomers, the document found that while the least accepting countries were those in Europe that have been directly affected by the recent migrant crisis, four were in the Middle East and North Africa — among them Israel, Egypt, Iraq and Jordan. The others were in Afghanistan and Pakistan, Myanmar, Thailand and Mongolia. Surveying 156 countries on the basis of factors such as citizens’ freedom, gross domestic product, expenditure on health and lack of corruption, the annual survey placed Scandinavian countries at the top. 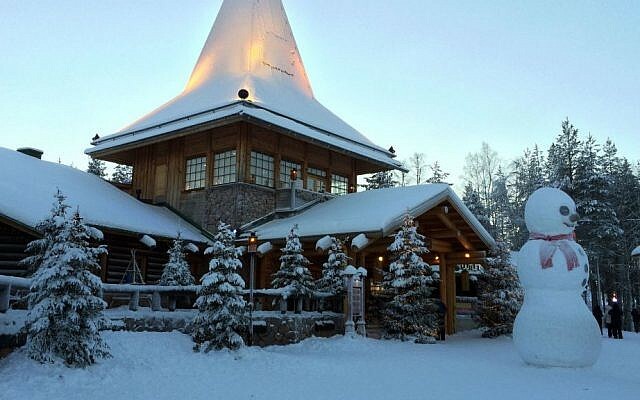 Fans of skiing, saunas and Santa Claus would not be surprised to hear Finland is the happiest place to live. Rounding out the Top 10 are Denmark, Iceland, Switzerland, Netherlands, Canada, New Zealand, Sweden and Australia. The United States fell to 18th place from 14th last year, and the UK was at 19. Relatively homogenous, Finland has about 300,000 foreigners and residents with foreign roots, out of its 5.5 million people. Its largest immigrant groups come from other European nations, but there also are communities from Afghanistan, China, Iraq and Somalia. 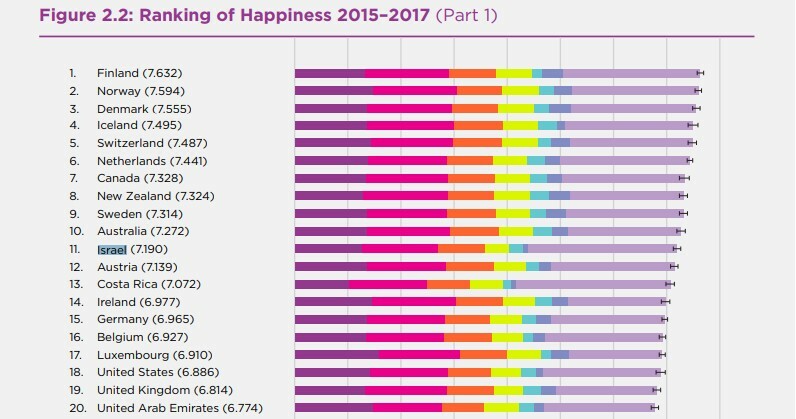 John Helliwell, a co-editor of the World Happiness Report and professor emeritus of economics at the University of British Columbia, noted all the top-10 nations scored highest in overall happiness and the happiness of immigrants. He said a society’s happiness seems contagious. The United States was 11th in the first index and has never been in the Top 10. To explain its fall to 18th, the report’s authors cited several factors. 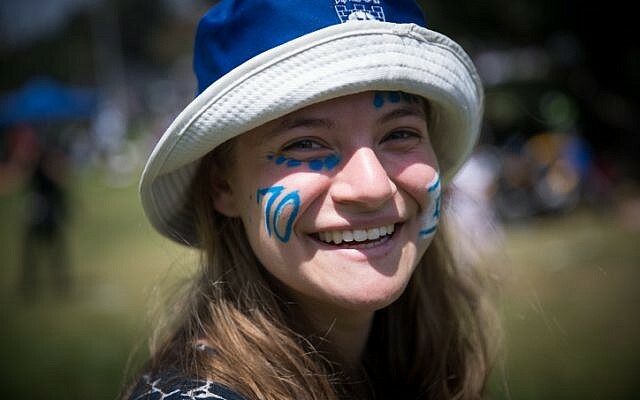 On Friday, Prime Minister Benjamin Netanyahu pointed to Israel’s consistently high scores on the global Happiness Index as evidence that Israelis, particularly young Israelis, were aware of his contributions to the country. Speaking to Fox News talk-radio host Mark Levin during an official trip to the US, Netanyahu — embroiled in a series of corruption investigations — said, “And people say, well, ‘How can that be? 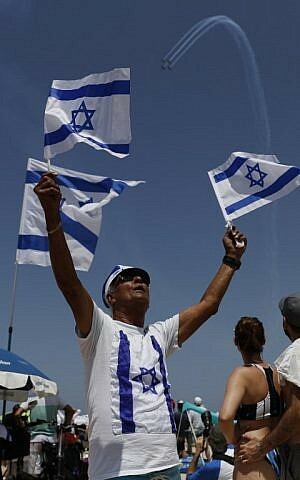 Must be a fluke,’ but [Israel’s ranking] keeps going up and they say, ‘How can it be? It’s a country in this horrible neighborhood, you’ve got terrorism, you’ve got radical Islam, you’ve got challenges,’ but it comes up ahead of most countries in the world,” said Netanyahu. “They say, ‘Yeah, but that’s the old timers, they are already fixed, their lives are okay, but that’s the old people, what about the young people? You know where they [the youth] come up [on the index]? Number five! Which means they have a real confidence in the future, and that’s because I think they appreciate and… I know that’s what drives me and animates me: How to ensure that the Jewish state has a permanent future of security and prosperity… and peace if we can get it. The people of Israel I think do identify that. 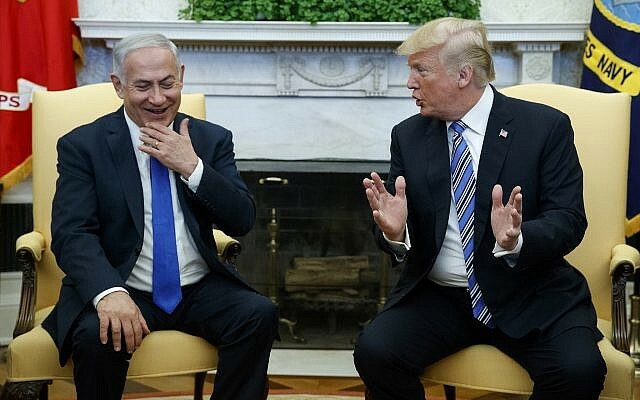 WASHINGTON — Less than one-fourth of his meeting with US President Donald Trump on Monday was devoted to the Palestinian issue, Prime Minister Benjamin Netanyahu told reporters hours after the leaders sat down at the White House. The Israeli premier added that the Trump administration has not showed him its much-anticipated peace plan, which officials have said they are finalizing and plan to unveil in the near future. They have given no specific timetable. Netanyahu, for his part, would not say whether he supported the emergence of a Palestinian state as part of that plan. “I haven’t named it, but I’ve defined it: The Palestinians should have the power of government, except the power to threaten us,” he said. 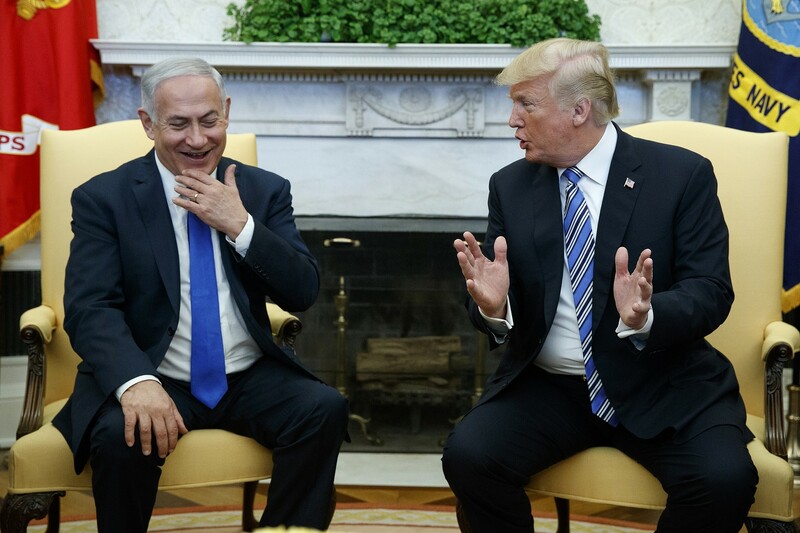 Asked by The Times of Israel if he told Trump that he supported, at least in principle, the establishment of a Palestinian state, Netanyahu merely said he told the president didn’t want Israel to rule over Palestinians. Asked if it ever had come up, Netanyahu said he could not recall. “It certainly didn’t come up today,” he offered. Despite President Trump’s son-in-law and senior adviser Jared Kushner, who is also his point man on the peace process, recently having had his security clearance downgraded, the Israeli leader said this matter did not come up in their discussions, in which Kushner himself participated. “We did not talk about Kushner,” Netanyahu said. He was referring to the deadline Trump imposed on lawmakers to unilaterally make changes to the 2015 nuclear accord — which Netanyahu vehemently opposes. If those changes are not made, Trump has threatened that he would abrogate the accord. UNITED NATIONS — Defying extraordinary pressure from President-elect Donald J. Trump and furious lobbying by Israel, the Obama administration on Friday allowed the United Nations Security Council to adopt a resolution that condemned Israeli settlement construction. Applause broke out in the 15-member Security Council’s chambers following the vote on the measure, which passed 14-0, with the United States abstaining. The vote came a day after Mr. Trump personally intervened to keep the measure, proposed by Egypt, from coming up for a vote on Thursday, as scheduled. Mr. Trump’s aides said he had spoken to the Israeli prime minister, Benjamin Netanyahu. Both men also spoke to the Egyptian president, Abdel Fattah el-Sisi. Egypt postponed the vote. But in a show of mounting frustration, a group of other countries on the Security Council — all of them relatively powerless temporary members with rotating two-year seats — snatched the resolution away from Egypt and put it up for a vote Friday afternoon. 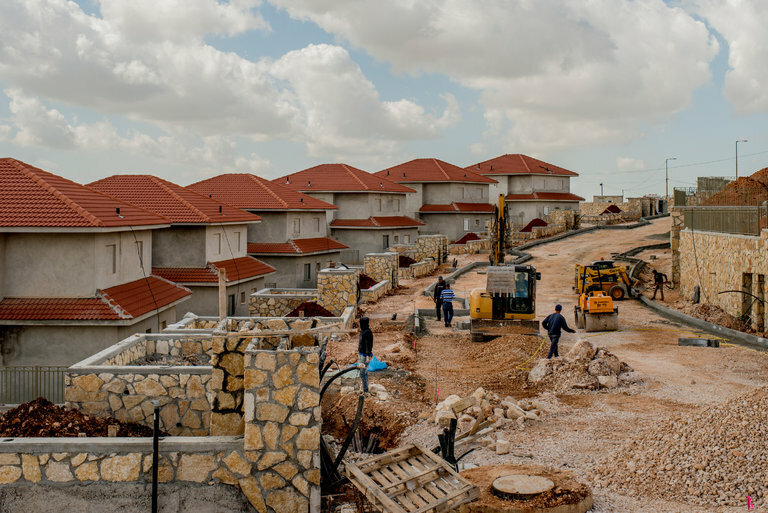 The departing Obama administration has been highly critical of Israel’s settlement building, describing it as an impediment to a two-state solution to the Israeli-Palestinian conflict. Mr. Trump has made clear that he will take a far more sympathetic approach to Israel when his administration assumes office in a month. Mr. Trump’s comments on the issue amounted to his most direct intervention on United States foreign policy during his transition to power. Israel’s ambassador to the United Nations, Danny Danon, who had urged the American delegation to block the measure, expressed his disappointment in a statement that looked forward to a change in policy under Mr. Trump. For those of you who do not know me, I am a 60-year-old white American man who is a fundamentalist Christian who is also a huge fan of the Nation of Israel. I am a person who is not an anti-Muslim or anti-Persian. Even though I do believe that the Jewish people are missing the reality that Yeshua (Jesus The Christ) and Yahweh (Jehovah The Father) I have no doubts about Israel and the Hebrew bloodline being very special to God The Father and The Son. The Christian faith is born out of the Jewish faith and the Arab people are descendants of the Father of Israel, Abraham through his son Ishmael. Whether it is a Nation, a people, or a singular person, it is a great sin to fight against the Nation of Israel. It is an old saying and a truthful one that I have heard several times throughout the years that the Palestinian people would have peace any time they decide they actually want it by simply laying down their arms and quit fighting against Israel. It is also a true saying that if Israel was to lay down their arms, there would be no Israel. The majority of Israel’s politics is based around the security issues of its people and of the State from attacks by people who believe that Allah is God. Think about it, who else is attacking Israel? This article tonight is one I thought of as I was reading the Times of Israel News Paper online. The names and the math figures are ones that I gleaned off of those articles so hopefully they were correct. As I said earlier, the single biggest issue in Israeli politics seems to always be about security issues. Within any government there is always many other issues that the leadership is responsible to make sure are addressed and taken care of for their people. There is always the issues of jobs, housing, power grids, transportation, garbage pickup and disposal and the list goes on and on. If the Leaders of a Nation or of a group of people are channeling their time into one issue like lets say President Putin is doing with Russia’s military, the people of your own Country suffers. For any Nation, any People to flourish the Leaders need to address the issues that affect the daily lives of their population. Just look at the situation in the Gaza Strip with Hamas as their ‘Governors’! The people of the Strip could have their own Country and be living in peace but Hamas will not allow it. They spend the majority of their income on military issues in their ‘struggle’ with Israel yet it is a ‘struggle’ that they themselves create. In Israel’s Parliament, the Knesset, you have some members who would build a very high wall to block off all of the Palestinian people in the West Bank and I am sure that there are some who would take all of this land they were given in the Land for Peace deal of 2005 if they were allowed to by Israeli law. The only way for that to happen is if these ‘hard lines’ can gain political control of Israel’s Government and elections are the only way to do this. There are other issues that would have to get involved in their Democracy like Israel’s Court system as well as considerations of U.N. sanctions and the such. In the Knesset Isaac Herzog who is the leader of the ‘Zionist Union Party’ (which is the second largest party as far as members of the Knesset) spoke yesterday of his opposition to Israel’s current Prime Minister Benjamin Netanyahu perceived plan to partition off the West Bank or at least big sections of it as being a mistake because of the issue that in doing so would bring in millions of Arab voters thus giving them more control of Israel’s political system. You need to remember that there are Arab Islamic believing members of the Knesset, if Israel partitions off the West Bank, there will become many more Islamic believing members of the Knesset. 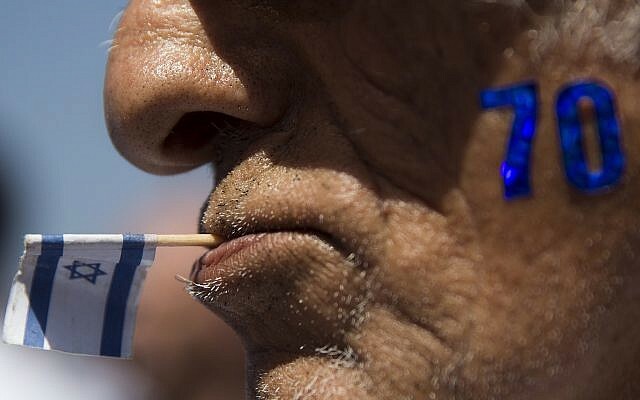 The Chairman of the Likud Party, which is the Party of the Prime Minister, Mr. David Bitan said that he would like it if Israel’s Arab population were not allowed to vote. This brought many critical comments toward him because he said this but his response, in my opinion, was appropriate. Think about this for a moment before you judge him. He said that any political party would like it if their competition were not allowed to vote. Don’t you think that Hillary Clinton would have liked it if no Republicans had been allowed to vote last month in the U.S. elections? Was what Mr. Bitan said actually racist? I don’t know, I don’t know this man’s heart, do you? If you do, you may have a more informed opinion. Before I make a book out of this article via giving too much time to the ‘set up’ material I am now going to address the political operation of the Knesset and the election of their Prime Minister’s position. Yesterday the Leader of the Yair Lapid Party Mr. Yesh Atid was calling for early Elections in an attempt to over through the current Government led by the Prime Minister’s Likud Party. Mr. Atid was using a recent poll showing that He and his Party were even with the Prime Minister’s Party in the poll. The next National election is scheduled for November 5th of 2019. In the Knesset for a Bill to pass it must get a majority of the votes which is a minimum of 61. Israel’s Governments require a Ruling Coalition to have at least 61 Seats. This gives very small political parties a large amount of power if they are part of the Ruling Party Coalition. As an example, the ruling Likud Party currently has 67 Seats through their Coalition. In this coalition you have the Jewish Home Party with 8 Seats and the Kulana Party with 10 Seats. 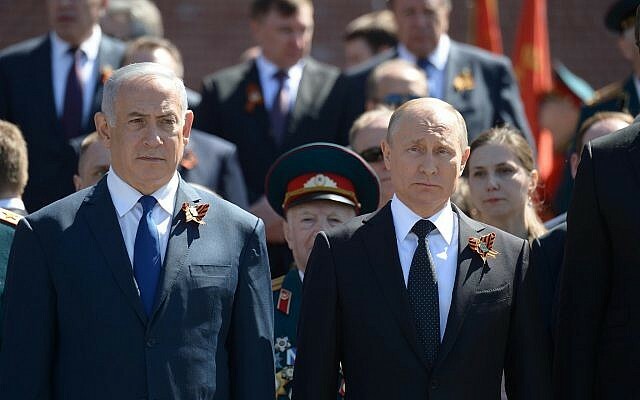 Under the current political setup if either one of these Parties decided to leave the Coalition, the Government of Prime Minister Netanyahu would fall and a new election would have to quickly be set up, the November 5th of 2019 date would mean nothing. Here is my suggestion that I wish Israel would consider because the people of any Nation need to know that their Government is secure so that the people themselves can make long-term decisions in their own lives. Here in the U.S. we the people know that our next Presidential election will be in November of 2020, it is set every 4 years, no matter what. I believe that for the Nation of Israel the people would be better served if the next elections aren’t held until the scheduled date in 2019. From that election forward I believe a better system would be that they keep the 61 votes for the purpose of passing any Bill’s yet drop the 61 Seat requirement for the Ruling Party. Hold your election in November of 2019 and if no Party gets above the 50% level (61 Seats) then have another election about 3 days later where only the top 2 vote getter are on the ballot. This election must be by the people, not the Politicians doing backroom deals. Then the Party who gets the most votes of the 2, wins. But, before the elections each Party must put forth who their Leader is so that the people decide whom they want to be their next Prime Minister. 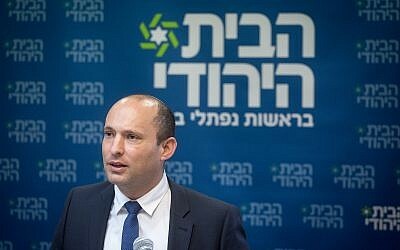 Even if the Ruling Party only has lets say 30 Seats like what Likud has now this leading vote getter will be the Ruling Party. Instead of the Prime Minister having to have 61 Seats they would only have to work with all the Members of the Knesset to get the other votes to help pass the Bill. I believe that this system would give the Government of Israel and the People of Israel more stability. Any economy, any people, need stability to be able to live in physiological peace and any Country that has ‘snap elections’ reeks of weakness which is never a good thing for the people the Government is supposed to be representing.